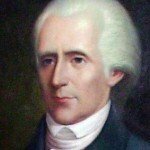 Richard Henry Lee (1732-1794) was a Virginian politician and revolutionary. Lee hailed from an affluent family in Westmoreland, Virginia (also the home county of George Washington, with whom Lee was on friendly terms). Lee became a member of the Virginian House of Burgesses in 1758 and from early in the revolution expressed radical views, drafting protests against the proposed Stamp Act and supporting Patrick Henry’s Virginia Resolves. Lee also worked outside the legislature, organising boycotts of the stamp tax and British goods. In 1774 he organised a day of prayer and fasting to protest the Coercive Acts and their effects on Boston. 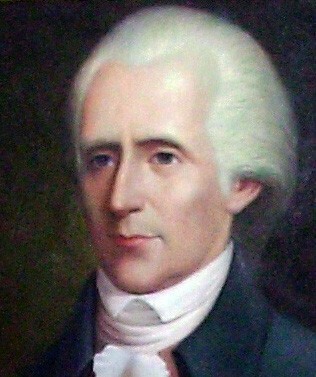 Richard Henry Lee is best known for raising in Congress in June 1776 and moving that the American colonies “are, and of right ought to be free and independent states”. He later served as a president of the Confederation Congress. Lee did not participate in the Philadelphia convention and later opposed the Constitution, on the grounds that it did not guarantee individual rights. With the drafting of the Bill of Rights, he came to support the republic, serving as a United States Senator (1789-92).